Announced alongside the EF 16-35mm F2.8L III USM and the Canon EOS 5D Mk IV, this lens is the long-awaited update to the much-liked original EF 24-105mm F4 IS USM. Read on to find out how well this new model performs. Canon has launched an affordable under-$1,000 EF-mount standard zoom for enthusiasts stepping up to full-frame who can’t afford a pro lens. At just $599, the new Canon EF 24-105mm f/3.5-5.6 IS STM features image stabilization (IS) as well as Canon’s latest stepping autofocus motor (STM) for video. With results just in, let’s see how this “budget” EF-mount lens stacks up against the pricier competition. Canon has announced a new 24-105mm standard zoom lens for its full frame DSLRs. Offering a versatile wide-angle through to short telephoto focal length the new Canon EF 24-105mm f/3.5-5.6 IS STM also features image stabilisation (IS) and a stepping autofocus motor (STM). Sigma 24-105mm F4 DG OS HSM A Canon mount lens review: A new standard? 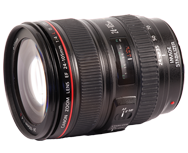 As a more modestly priced alternative to the EF 24-70mm f2.8L II USM and with a longer reach than the newer stabilized EF 24-70mm f4L IS USM, the similarly stabilized EF 24-105mm f4L IS USM remains a popular model for Canon users. As a new addition to the Art-series, the Sigma 24-105mm f4 DG OS HAS looks promising, but can the firm replicate the image quality of their recent 35mm f1.4 and 18-35mm f1.8 models? Read on to find out. Announced in February 2012, the Tamron 24-70mm f/2.8 lens Di VC USD is the latest full-frame, fast aperture standard zoom from the Saitama, Japan-based optical firm and is the first of its type to add VC (Vibration Control) image stabilization. Costing $1299 and available in Canon, Nikon and Sony fittings (the latter albeit without VC) and featuring USD (Ultrasonic Silent Drive) technology, it’s an obvious alternative to the pricier offerings from the top-names. Could this lens be a contender in the IQ stakes? Read on to find out. Canon EF 24-70mm f/4L IS USM review: The ideal standard zoom? Introduced in November 2012 as the proposed ‘kit’ lens for the EOS 6D, the EF 24-70mm f/4L IS USM lens represents an interesting move for Canon – despite two well respected lenses in this category, the EF 24-70mm f/2.8L USM and the EF 24-105mm f/4L IS USM, the EF 24-70mm f/4L IS USM hopes to offer a compact, lightweight lens suitable for the newly created lightweight, full-frame camera segment. The red L-series band offers the promise of professional performance, but does it live up to the expectations? Introduced in February 2012, the EF24-70mm f/2.8L II USM is the long-awaited update to Canon’s pro-grade standard zoom and replaces the highly regarded EF24-70mm f/2.8L USM. Designed with the objective of improving image quality and providing greater durability for daily use with digital cameras, it has a completely revised optical design as well as an enhanced mechanical construction. As full-frame lens, it’s compatible with the firm’s full range of DSLRs including 1.6 (APS-C) and older APS-H (1.3x crop) DSLRs making it an attractive choice to a wide of range users. However, at around $2,500 it’s not likely to be a casual purchase.